Synthetic peptide (the amino acid sequence is considered to be commercially sensitive) within Human Histone H3 aa 100 to the C-terminus. The exact sequence is proprietary. WB: HeLa, NIH3T3, Saccharomyces cerevisiae and Schizosaccharomyces pombe whole cell lysates. Drosophila embryo nuclear extract lysate. IHC-P: Human colon, Mouse liver, and Rat pancreas tissues. ICC/IF: HeLa cells. ChIP: HeLa chromatin. Our Abpromise guarantee covers the use of ab176842 in the following tested applications. IHC-P 1/5000 - 1/10000. Perform heat mediated antigen retrieval with Tris/EDTA buffer pH 9.0 before commencing with IHC staining protocol. Chromatin was prepared from HeLa cells according to the Abcam X-ChIP protocol. Cells were fixed with formaldehyde for 10 minutes. The ChIP was performed with 25µg of chromatin, 2µg of ab176842 (blue), and 20µl of Protein A/G sepharose beads. No antibody was added to the beads control (yellow). The immunoprecipitated DNA was quantified by real time PCR (Taqman approach for active and inactive loci, Sybr green approach for heterochromatic loci). Primers and probes are located in the first kb of the transcribed region. Immunofluorescent analysis of 4% paraformaldehyde-fixed, 0.1% Triton X-100 permeabilized HeLa (Human epithelial cells from cervix adenocarcinoma) cells labeling Histone H3 with ab176842 at 1/2000 dilution, followed by Goat anti-rabbit Alexa Fluor® 488 (IgG) (ab150077) secondary antibody at 1/400 dilution (green). Confocal image showing nuclear staining on HeLa cell line. The nuclear counter stain is DAPI (blue). Tubulin is detected with ab7291 (anti-Tubulin mouse mAb) at 1/500 dilution and ab150120 (goat anti-mouse AlexaFluor®594 Goat secondary antibody) at 1/500 dilution (red). -ve control 1: ab176842 at 1/2000 dilution followed by ab150120 (AlexaFluor®594 Goat anti-Mouse secondary) at 1/500 dilution. -ve control 2: ab7291 (anti-Tubulin mouse mAb) at 1/500 dilution followed by ab150077 (Alexa Fluor®488 Goat Anti-Rabbit IgG H&L) at 1/400 dilution. 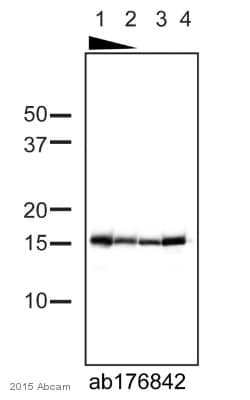 This blot was produced using a 4-12% Bis-tris gel under the MES buffer system. The gel was run at 200V for 35 minutes before being transferred onto a Nitrocellulose membrane at 30V for 70 minutes. The membrane was then blocked for an hour using 2% Bovine Serum Albumin before being incubated with ab176842 overnight at 4°C. 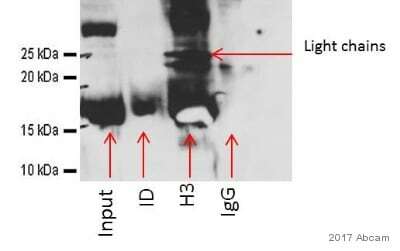 Antibody binding was detected using an anti-rabbit antibody conjugated to HRP, and visualised using ECL development solution ab133406. 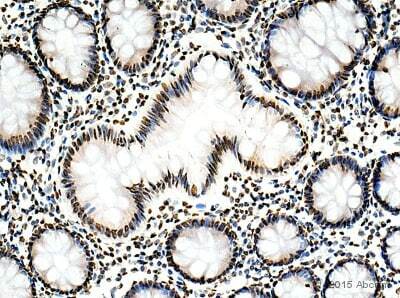 Immunohistochemical analysis of paraffin-embedded Human colon tissue labeling Histone H3 with ab176842 at 1/500 dilution, followed by Goat Anti-Rabbit HRP (IgG; H&L) secondary antibody (ab97051) at 1/500 dilution. 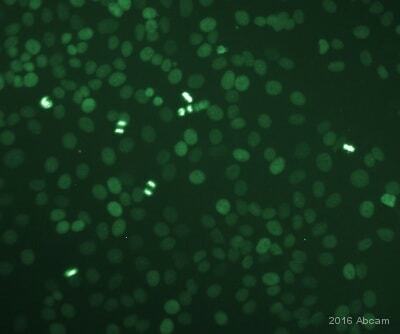 Nuclear staining on glandular epithelium of Human colon tissue is observed. Counter stained with Hematoxylin. Negative control: Used PBS instead of primary antibody, secondary antibody Goat Anti-Rabbit IgG H&L (HRP) (ab97051) at 1/500 dilution. Immunohistochemical analysis of paraffin-embedded Mouse liver tissue labeling Histone H3 with ab176842 at 1/500 dilution, followed by Goat Anti-Rabbit HRP (IgG H&L) secondary antibody (ab97051) at 1/500 dilution. 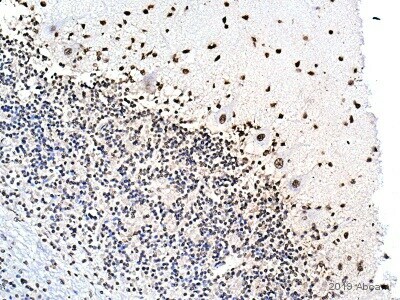 Nuclear staining on mouse liver tissue is observed. Counter stained with Hematoxylin. Immunohistochemical analysis of paraffin-embedded Rat pancreas tissue labeling Histone H3 with ab176842 at 1/500 dilution, followed by Goat Anti-Rabbit HRP (IgG H&L) secondary antibody (ab97051) at 1/500 dilution. Nuclear staining on rat pancreas tissue is observed. Counter stained with Hematoxylin. Flow Cytometry analysis of HeLa (human cervix adenocarcinoma) cells labeling Histone H3 with purified ab176842 at 1/40 dilution (10ug/ml) (red). Cells were fixed with 4% paraformaldehyde and permeabilised with 90% methanol. 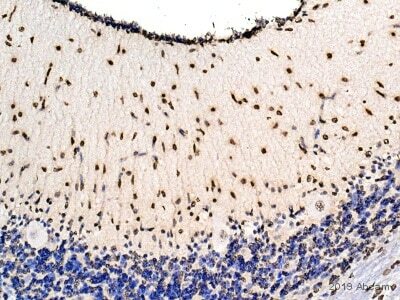 A Goat anti rabbit IgG (Alexa Fluor® 488)(1/2000 dilution) was used as the secondary antibody. Rabbit monoclonal IgG (Black) was used as the isotype control, cells without incubation with primary antibody and secondary antibody (Blue) was used as the unlabeled control. ab176842 was tested in Peptide Array against 501 different modified and unmodified histone peptides; each peptide is printed on the array at six concentrations (each in triplicate).